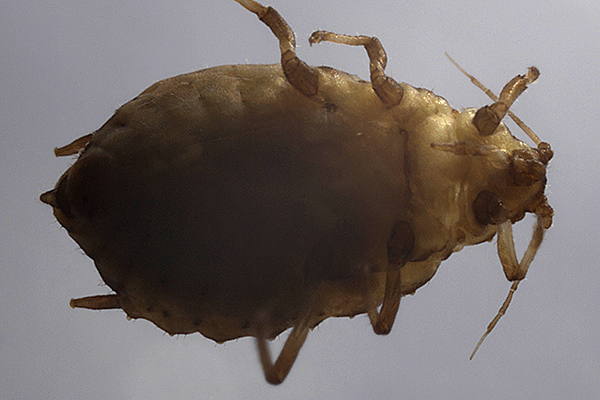 Ceruraphis eriophori is a medium-sized, oval, aphid. The antennae are short, only 0.29-0.37 times their body length. The dorsum of the fundatrix on the primary host (see first picture below) has extensive dark sclerotization. 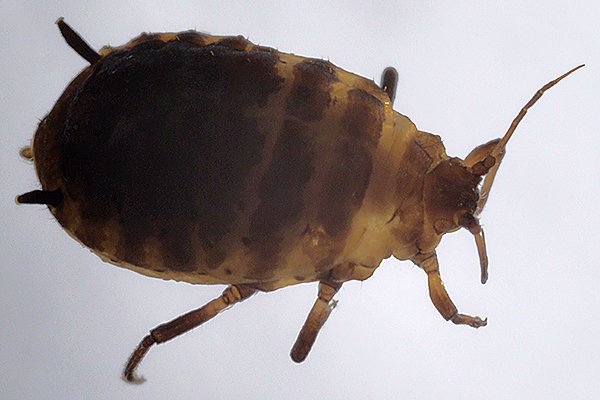 The same is true for Ceruraphis eriophori apterae on their secondary host. The siphunculi are black and are more than twice as long as the very short conical cauda. 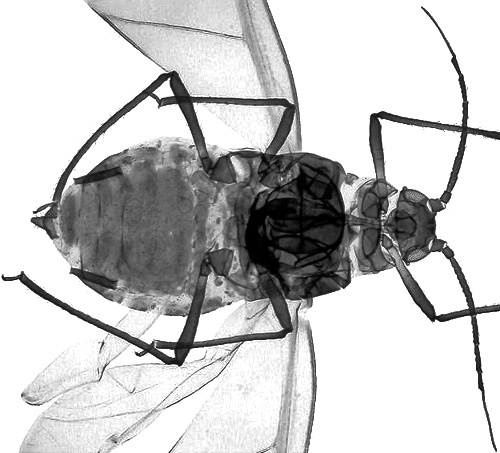 The body length of the Ceruraphis eriophori fundatrix is 2.5-3.0 mm, and that of the aptera on the secondary host is 2.0-2.8 mm. 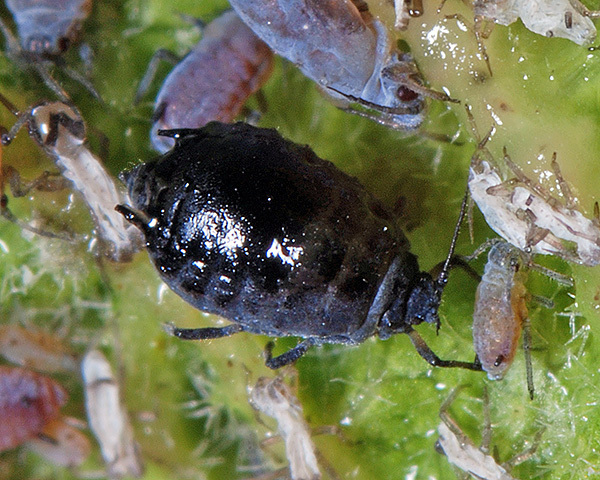 The nymphs produced by the fundatrix are violet coloured (see first picture above) and all develop to alates (see second picture above) which migrate to the secondary host. The alate is brown with extensive sclerotization on the abdomen. 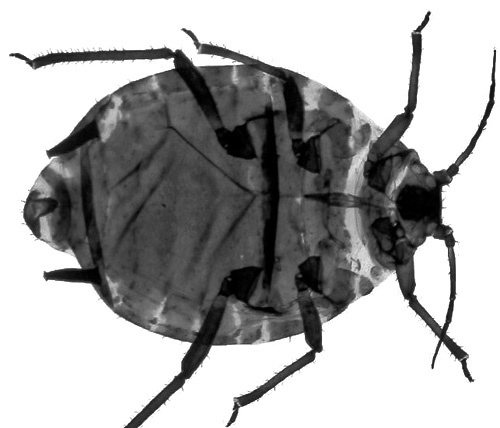 The micrographs below show an adult fundatrix in alcohol, dorsal and ventral views. The clarified slide mounts below are of adult viviparous female Ceruraphis eriophori (from the primary host) : wingless, and winged. 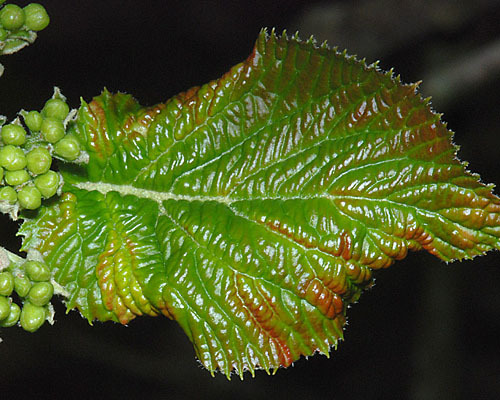 The wayfaring tree - sedge aphid host alternates between Viburnum species (especially wayfaring tree, Viburnum lantana) and various sedges (Carex species). On the wayfaring tree Ceruraphis eriophori lives in a pseudogall of curled leaves. Ceruraphis eriophori is found in Europe and northern India, and has been introduced to North America. There seems to be very little published information on Ceruraphis eriophori. In New Brunswick, USA MacGillivray(1960) compared the taxonomy and biology of the invasive Ceruraphis eriophori with the indigenous Neoceruraphis viburnicola. 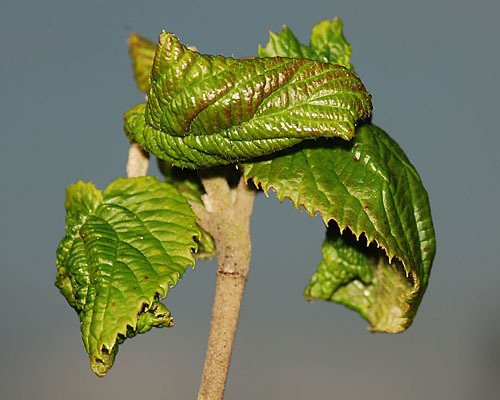 Both could be found in spring and autumn in the curled leaves of their Viburnum primary hosts. The overwintering eggs on wayfaring tree hatch in spring, and the nymphal fundatrices feed on the young shoots. 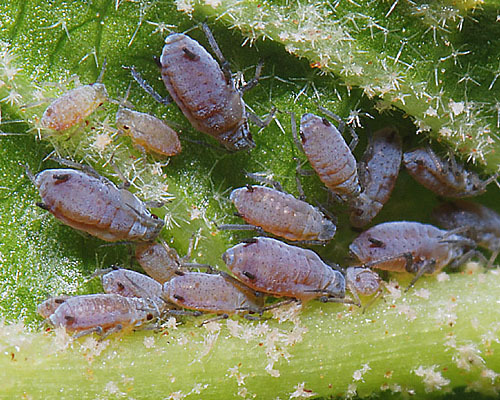 This makes the leaves shrivel and curl downwards, thus enclosing the aphids in a pseudogall. These pseudogalls are very conspicuous on the tree in spring (see pictures below). 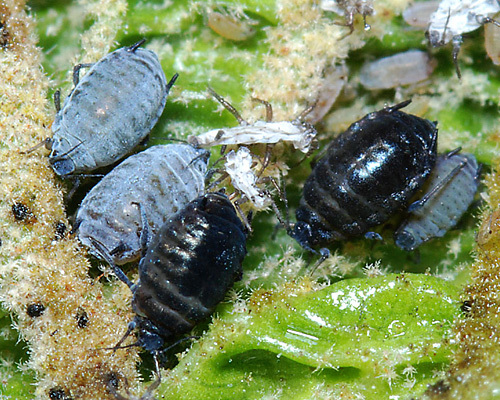 The developing fundatrices are greyish before maturing to the black adult fundatrices (see first picture below). 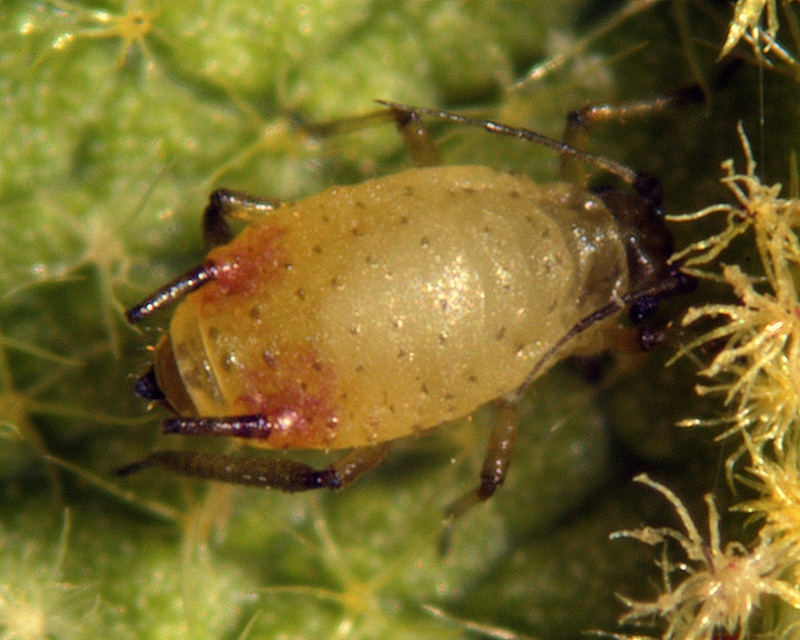 The fundatrices then produce characteristic violet-coloured nymphs (see second picture below) which fill the gall. Ceruraphis eriophori produce large amounts of honeydew, which can make the galls and surrounding leaves very sticky. 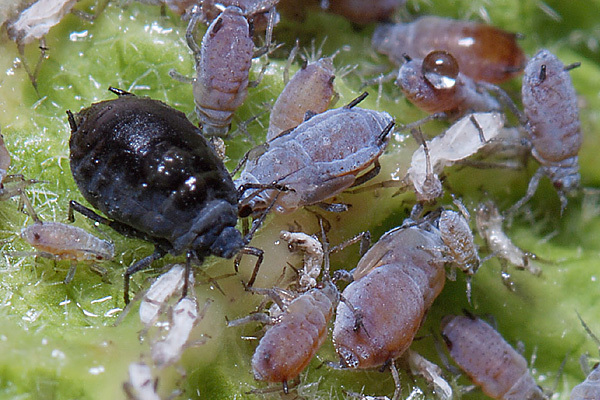 All the violet-coloured nymphs mature to alates (see picture below) which migrate to the secondary hosts. We have yet to find Ceruraphis eriophori on their secondary host (hence no pictures), although it must be fairly common given the abundance of the species on the primary host in some locations. The return migration, presumably of gynoparae and males, occurs in September-October. 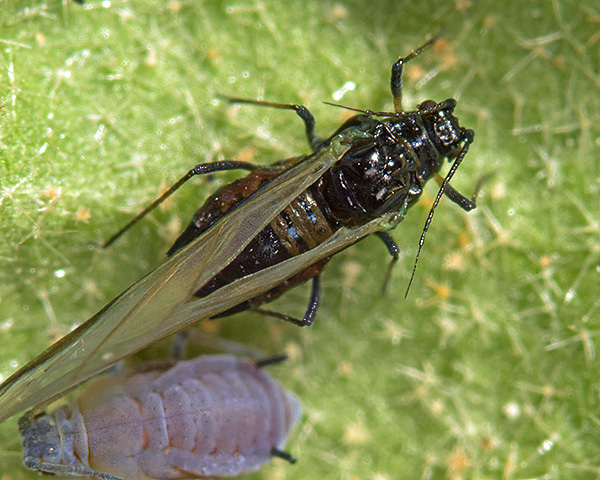 The oviparae are largely unsclerotized and coloured yellowish-green to dirty whitish (possible picture above). They have strongly swollen hind tibiae bearing numerous scent glands. 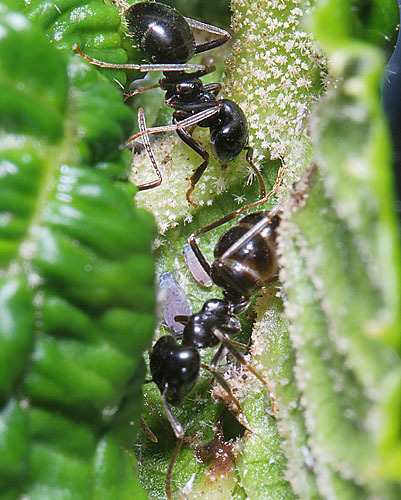 Sometimes (but not always), Ceruraphis eriophori are attended by ants feeding on the excreted honeydew. We have found two species of ants attending Ceruraphis eriophori, jet black ants (Lasius fuliginosus, first picture below) and a Myrmica species (second picture below). 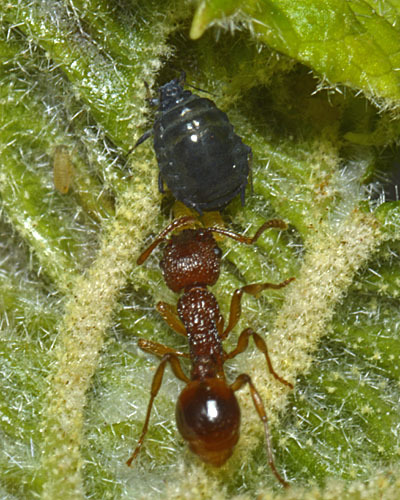 Where ants are in attendance, the colonies of Ceruraphis eriophori in the galls tend to be much larger. Blackman & Eastop list 7 species of aphid as feeding on wayfaring tree (Viburnum lantana) worldwide, and provide formal identification keys. 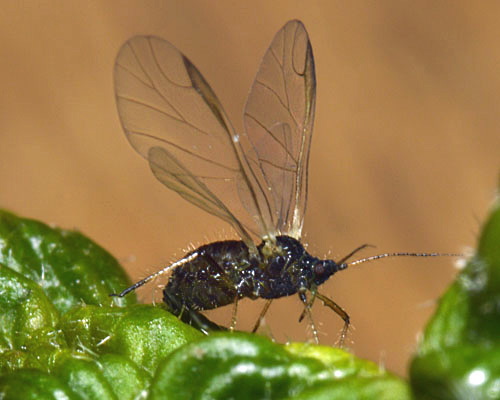 Of those aphid species, Baker (2015) lists 5 as occurring in Britain: Aphis fabae, Aphis lantanae, Aphis viburni, Ceruraphis eriophori and Myzus persicae. Ceruraphis eriophori is not considered to cause any economic damage in Europe. However, in America it is an alien invasive species, and is considered a potential threat to the long term survival of the endangered false hop sedge (Carex lupuliformis) (Environment Canada, 2014).